To order a printed copy of the Visit Greater Yarmouth brochure, simply click the Request button below. Who doesn't love a day out, last-minute holiday or short break beside the sea, exploring coast and countryside or messing about on the river? Greater Yarmouth's unique location means you can fit all this in to your getaway, whatever the weather or time of year and whatever you want to do with your time off. How to get there, where to stay & fantastic things to do - all in the 2019 guide! 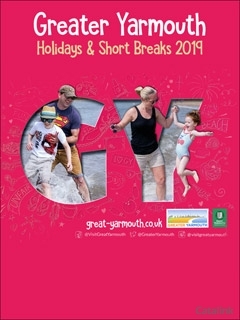 Order the 2019 Visit Greater Yarmouth brochure today for inspiration on an unforgettable UK visit. Visit Greater Yarmouth Brochure Colm M. said: Valuable information for our guests for onward travel. #ShareTheGreatTimes at the Easter Fair! As the holiday experts, Thomas Cook has a huge range of worldwide holidays, flight only deals and much, much more. Sign up to their newsletter today to find out about the latest offers and news on your getaway. By pressing the Request Printed Brochure button you give consent to Visit Greater Yarmouth (and their Data Processors for the specific purpose of delivering your literature) to send you their Brochure .